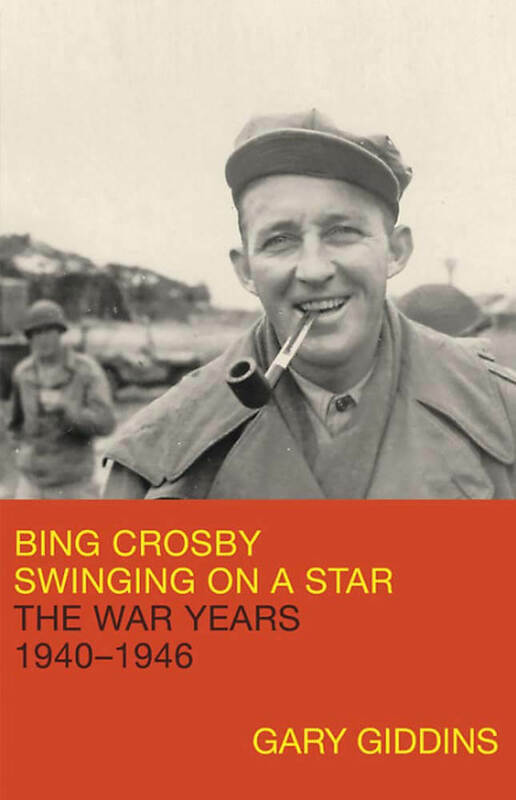 As someone who markets books for a living, my first thought on picking up Swinging on Star, the second volume of Gary Giddins's biography of Bing Crosby, was that Giddins is making things awfully hard on his publisher. He published the 700-page volume one, Pocketful of Dreams, in 2001, to great acclaim. Seventeen years later, we have volume two — and it clocks in at more than 600 pages and only covers 1940 to 1946. A biographer who devotes more than 1,300 pages to his subject, and even at that doesn't cover the last three decades of his life, is making an audience-limiting decision. And yet it's the copiousness of these books that makes them so valuable, and such compelling reading. In these two volumes, Giddins traces the development of American culture through the first half of the twentieth century from the vaudeville era of local and regional entertainment to a national broadcast culture that linked nearly every part of the rapidly urbanizing, industrializing powerhouse that was midcentury America. And Bing Crosby was part of every stage. Pocketful of Dreams follows the young singer through his earliest years on the dying vaudeville circuit and offers a wholly convincing account of how he absorbed — in a way that few if any of his white peers did — the innovations of Louis Armstrong, whom Crosby once called "the beginning and the end of music in America." Crosby carried the swing of jazz into pop, imbuing the best of his records with a light verve that still bustles with life today, and leaves the work of most of his contemporaries in the pop landscape mired in sepia. By the end of Giddins's first volume, Crosby is thirty-six and the biggest star in the world, leader of one of the most popular variety shows on radio, and a bankable star on screen. Swinging on a Star picks up in 1940. Bing’s wife, Dixie, was deep into alcoholism, and Bing seems to have dealt with it largely by throwing himself into work, his absence both protecting him from and exacerbating the problem. Affairs followed, though Bing wasn't a Hollywood bed-hopper; Crosby's relatively few liaisons seem to have been matters of the heart. When he was home, Crosby was a strict disciplinarian with his four sons, though if Giddins's account is correct, there was little sign of the sort of abuse that Crosby’s son Gary would later allege in a painful memoir. To have been the child of a figure as dominating as Bing Crosby could never have been easy. His inability to express love, his insistence on perfection, and the frustrations growing out of his relationship with Dixie make it obvious why his children were unhappy. The first of the Bob Hope/Bing Crosby Road movies, The Road to Singapore, was released in 1940, the year this book opens. Giddins is great at explaining these films in their moment and in making clear what does and doesn't work about them today: They are full of hoary jokes, mugging, and wholly, at times offensively, ignorant portrayals of their supposed settings, but they can still genuinely surprise with their inventiveness and wit, and the chemistry among Hope, Crosby, and Dorothy Lamour remains potent. But the chapters on the making of Crosby's greatest film, Going My Way (1944), are where Giddins's interest in detail and willingness to be expansive to tell a good story really shine. He could have cut the ten pages he devotes to the film's writer and director, Leo McCarey, without anyone realizing, but the book would have been the less for it. And it helps you appreciate the film, which, if it shows its age in spots, nonetheless holds up. Crosby's performance — which would win him the Best Actor award — is remarkable. For once, he's not simply playing Bing: he puts across a genuine depth of feeling, especially in a scene where he gently puts an aged priest to bed with an understated, beautiful rendering of "Too-Ra-Loo-Ra-Loo-Ral (That's an Irish Lullaby)." The film lifted that song from decades of obscurity; it and the clever new number "Swinging on a Star" went straight from the movie into the American repertory. By this point, though The Kraft Music Hall remained a top radio hit, it had begun to bore and irritate Crosby. Because it was broadcast live, like all radio at the time, it tied him to Hollywood at least once a week for most of the year. On top of that, it wasn't as much fun as recording and didn't pay as well as film. He would eventually force the network to allow him to record the show in advance, a step that ultimately changed the nature of network radio. Listened to today, The Kraft Music Hall is at best diverting, at worst a snooze, never as funny as the best radio comedy of the era. Its weakness is never more apparent than when a truly creative guest like Victor Borge appears; as he elicits genuine laughs, you can almost hear the dust being shaken out of the curtains. Meanwhile, Crosby recorded constantly. Giddins's discography lists more than two hundred tracks recorded between 1940 and 1946. He continued his pattern of recording the occasional brilliant song, like "Pistol-Packin' Mama" and "Don't Fence Me In," both enlivened by the Andrews Sisters, or "Is You Is or Is You Ain't My Baby," with Louis Jordan, alongside more pedestrian fare. Crosby's reliance on John Scott Trotter as his arranger and conductor bears a lot of the blame for the latter. A decade later, Nelson Riddle and Billy May would help Frank Sinatra make lasting records through their arrangements, but Trotter's are almost wholly forgettable. Crosby’s choices of material also were often undiscerning. Yet, at his best, he still showed the effortless swing, flawless timing, and light touch that made him a star. He had shed the most mannered aspects of his style and could put a lyric across beautifully. Try listening to his elegant, restrained interplay with a young Les Paul on his 1945 hit "It's Been a Long, Long Time" and imagine you're a returning soldier, or a lonely homefront wife. The quiet emotion of the song can be overwhelming. Giddins's account of Crosby's work in support of the war effort is the most revelatory aspect of Swinging on a Star. Huge sections of the book are essentially travelogues recounting the shows Crosby put on for troops all over the world. Crosby seems to have been willing to go anywhere to perform for troops, whether it was a late-night drop-in at the Hollywood Canteen or a dangerous trip to just behind the front after D-Day. As he traveled in France, doing as many as five shows a day from the backs of flatbed trucks, he brought battle-hardened men to tears. The song they wanted to hear was "White Christmas": "If he opened the show with it to get it out of the way, he would just have to sing it twice." A Third Army medic wrote to a friend at home: " [W]hen he sang 'White Christmas' there wasn't a sound, not even breathing, and suddenly no one was looking at Crosby, but just at the ground and making a little wish. . . . And so back to our tents, but the men are smiling now." Any time officers tried to horn in, Crosby shut them down: he was there for the enlisted men, and he made sure they got the best seats. "Nothing in his life, he insisted, gave him as much 'pride and satisfaction' as making those 'guys happy for a few moments.'" When Swinging on a Star ends, in 1946, Crosby is the most popular entertainer in the world. That year, the middle of a five-year run as the top box office draw, Crosby starred in three of the year's five top-grossing films. "White Christmas" had begun what would be an annual assault on the charts, repeated every December through 1960. The war, which transformed every aspect of American life, had also transformed Crosby, taking him from a popular singer to a full-fledged symbol of the American life and homefront that millions of soldiers had fought for. At the same time, his only true rival, Frank Sinatra, was at low ebb: the public remained skeptical of his draft deferment, his voice was shot, he couldn't get movie roles, and he would soon be dropped by his label. Bing was forty-three and absolutely unchallenged. Yet for most people, Bing exists today almost solely through two songs: "White Christmas" and, weirdly, his ghostly duet with David Bowie on "Peace on Earth/The Little Drummer Boy," recorded a month before Crosby's death in 1977. If you're Catholic, perhaps you've seen him playing Father O'Malley in Going My Way or The Bells of St. Mary's. Odds are, however, that you've never watched any of his and Hope's Road movies, never heard The Kraft Music Hall, never really understood why he was a big deal. Why has Bing all but disappeared as a cultural figure, while Sinatra has remained vibrant? It's not something we can ever determine definitively, but we can tug at some possible reasons. One is timing: America made its icons in the 1950s — Elvis, Marilyn, James Dean, Sinatra. Bing's biggest days were behind him by then, and he was older than the rest of that group, indelibly associated with the war years. Then, in 1957, the widowed Bing married Kathryn Grant, an actress more than thirty years his junior. Bing seems to have decided to not repeat at least one of the mistakes of his first marriage; he cut way back on his work and travel. Whereas Sinatra laid a loud claim to Vegas, Bing spent the 1960s quietly. He also didn't have anything like the run of brilliance Sinatra would achieve for Capitol in the 1950s. The arrival of rock and roll and its transformation of the pop landscape didn't help: so much of Bing's best work is pop, and when generational change transformed that audience, the adult music of an earlier era was dismissed as quaint. Impatient with introspection, he communicated in a language of joking camaraderie: stoic, manly, rarely nostalgic, never sentimental, and often flippant. Admired for his intelligence, quick wit, and ability to converse about anything, he could not always resist the urge to sermonize. He was a devout Catholic, confident, independent, obstinate, and unaffectedly modest. As Tony Bennett put it, not disparagingly, "Bing invented suburbia." Though Sinatra would also always be out of step with the Boomers, you can nonetheless see why his version of cool, all fire and flair and emotion, could become iconic in a way that Bing's — the essence of gramps to the young — couldn't. The final blow was likely the publication of Gary Crosby's memoir in 1983. In it, he detailed a terrible childhood, marked by Dixie's alcoholism and Bing's emotional and physical abuse. Though at least one of his brothers disputed his account, and Giddins certainly seems skeptical of the degree of mistreatment, Crosby's reputation as a public figure — which had always relied on his charm and good nature — was never the same. I suspect most people my age first knew Bing like we first knew Joan Crawford: as a child abuser. So Bing faded. The seasonal pull kept "White Christmas" with us, but the rest of his achievement slipped to the back pages of the culture. That's why Giddins's books are so important: through 1,300 meticulously researched pages, he has restored Bing to his proper place in American cultural history. In doing so, he lets us see — and hear — him anew. Levi Stahl is the marketing director of the University of Chicago Press, the editor of The Getaway Car: A Donald E. Westlake Nonfiction Miscellany, and coeditor of The Daily Sherlock Holmes (forthcoming October 2019). He tweets, mostly about books.